My mod doesn't have anything to do with the crash, the only thing looking at the stacktrace could be Optifine. The Mekanism, EnderIO, Botania, Psi, AbyssalCraft and FuturePack ores are still not supported. The AbyssalCraft, EvilCraft, IntegratedDynamics, Natural Pledge, FuturePack, Random things and Bood Arsenal woods are still not supported too. I have a question, why do you add ore nuggets from mod which add alreadt these same nuggets like TechReborn ores for example. It just creates duplication for nothing. In more your nuggets are even not registered in the ore dictionary. It has for consequence that I can't use other mod ore nuggets for crafting the signs. Sorry for the late response, I've been quite busy. The reason is that TechReborn doesn't add a recipe to get the nuggets, otherwise I would use its nuggets, that's the only mod I have done that too if not one of the other mods have added own nuggets afterwards. All the nuggets are registered in the ore dictionary, but each sign only have a specific nugget. The reason for only having one mods ingot and nugget for one unique sign is because all the mods have different textures on their blocks and therefor they have specific sign textures. That's also a reason why adding mods take time, I made the decision to do it this way in the beginning and I've stuck with it. 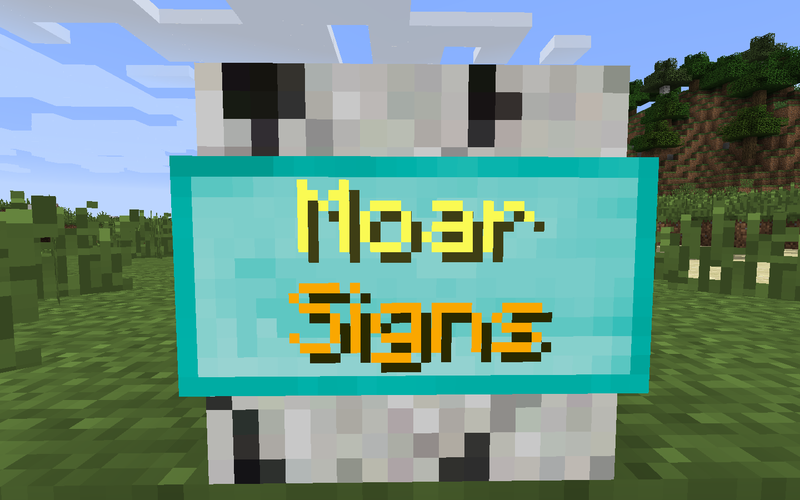 When there is support for the same metal from more then one mod, you can make a sign with one mod and change between the different mods textures with the SignToolbox. Are you planning any more updates to 1.7.10? Are there any known issues in 1.7.10? I'm not planning any more updates for 1.7.10 other then fixes if something is found, and that answers the next question, I know any issues at the moment with the 1.7.10 version. I had some issues with typing into the sign and it was leaving off letters of words. Sometimes if I intentionally mispelled a word such as machine room and spelled with an extra e or m it would finally post it. I was using a gold sign. Could you add an integration for TechReborn and Substratum ores ? I'm pretty sure that "flatsigns" does this, at least for vanilla signs. I have not tried it with the signs from this mod. You can place all the signs flat on the ground by shift clicking it, you can also place the signs on the underside of blocks. Just FYI, Tinkers Construct is available for 1.8.9 now. Let's have some log signs, too!